Jake & Tasha. RIP. We loved you both and you will be missed forever. 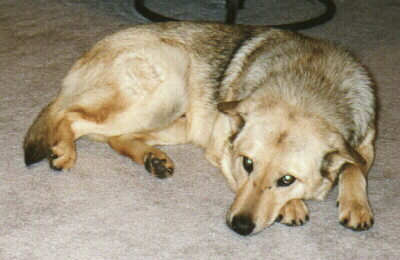 Jake was a 56-lb, 10-year-old German Shepherd/Akita mix. He was as sweet as ever- I don't think he has a mean bone in his body. I got him in April of 1997, when he was around 1.5 years old. He was found on the street, and was obviously an abused dog. He was afraid of many things, and nervous around people he did not know... but definitely wanted only to be appreciated and loved! It took many years, but he gradually came out of his shell. He never really settled down all completely, but instead established his own definition of happiness and content. Always a little on the anxious side, he loved to simply be doing things. This picture was taken soon after I brought Jake home. Christmas 1997! 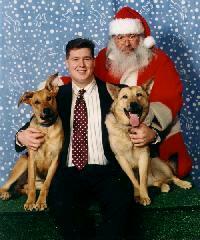 Jake, Ginger and I went to PetSmart to visit Santa. Tasha was 40-lb, 12+ year old Australian Shepherd mix. An ex-girlfriend and I got her back in Austin, Texas, in Febraury 1994 when she was 2 years old. 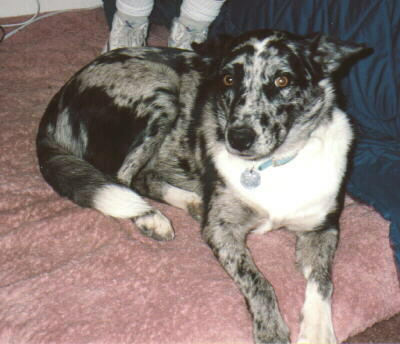 She was a well-behaved dog, but has those herding instincts that give her a bit of a wild side - she loved to be around horses, chasing them almost as much as she chased cats! She had been living in Salt Lake City with my ex for a couple of years after we broke up, but in I traded Pacey for her in July 1998. Coby (short for Jacoby, a Dutch name) was a Keeshond that Kelly's family got as a puppy in 1983. She was a smallish, very fluffy black & silver dog that they kept in their back yard in Fresno, California. She lived to a ripe old age of 16 (she died in late December 1999), though her last few years she was starting to show her age. Despite being mostly deaf and blind with severe arthritis, she still kept going for a long time. 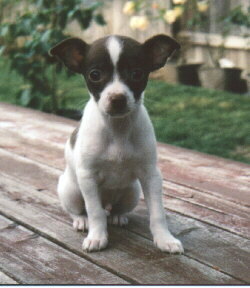 When I got Pacey, he was a tiny 1-lb, 3-month old miniature AKC Chihuahua. I never quite considered him a dog - to me he was always a "Rog" (Rat Dog). Having a Chihuahua is quite different from having any other dog. Because of their small size, they have a hard time being housebroken (an entire work day is an eternity for them). They also seem to require far more constant human attention than other breeds. This was not what I was looking for in a dog (I had been talked into getting Pacey by a girl I was dating at the time). After a few months, I decided that "Rogs" were not for me -- so I arranged to swap Pacey for Tasha. Tasha was too difficult for an ex in a small house with 5 cats and a 15-lb dog. In case you were wondering, Pacey was named after the character on Dawson's Creek. Ginger was a 65-lb, 8-month old German Shepherd/Doberman mix. I got her in October 1997 at 5-months. She was everything a big puppy should be - wild, destructive, and ever so cute. However, after 3 months of frustration, she remained un-housebroken, and very destructive -- she pulled my dryer out from the wall to chew up the vent hose & power cord. Twice! She longed to be an outdoor dog, with lots of room to run... so I had to let her go to a better environment.